How to identify the situations in which you are more likely to succeed? 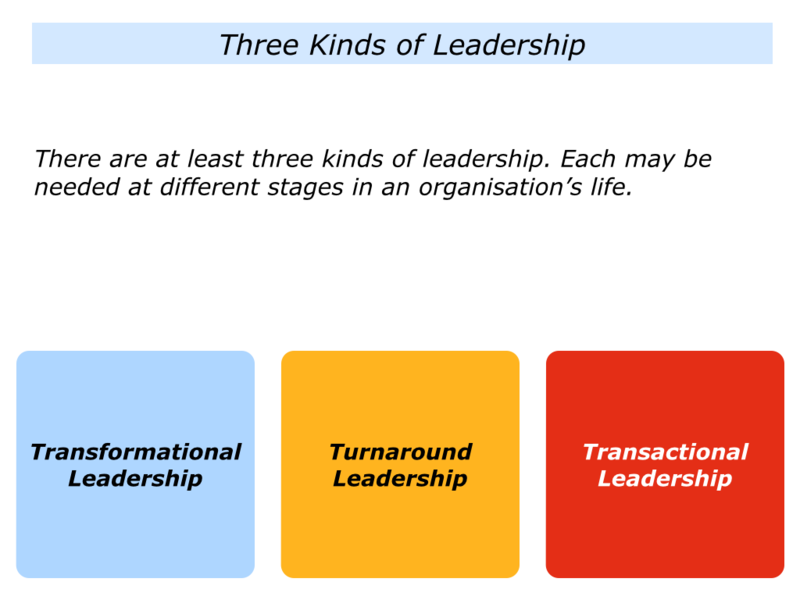 One approach is to distinguish between three kinds of leaders. These are Transformational, Turnaround and Transactional leaders. James MacGregor Burns coined some of these terms in the 1970s. He mainly studied political leaders, but the ideas have since been researched in organisations, business and other fields. This has resulted in expanding some of the original definitions. Different organisations may need different types of leaders at different times in their development. 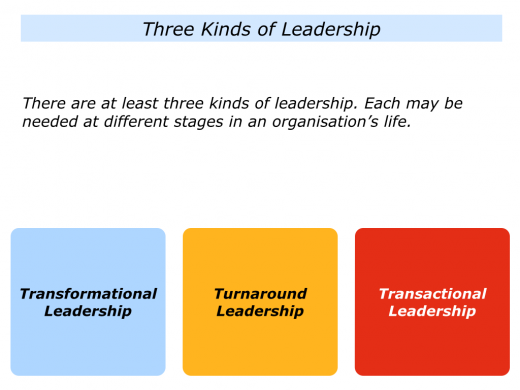 Let’s explore the three kinds of leaders. Burns believed that transformational leaders connect with people on a values level. They translate this into an inspiring vision and energise people to deliver visible results. Some people love working for such leaders. They are encouraged to take ownership, combine their talents and continue to develop. 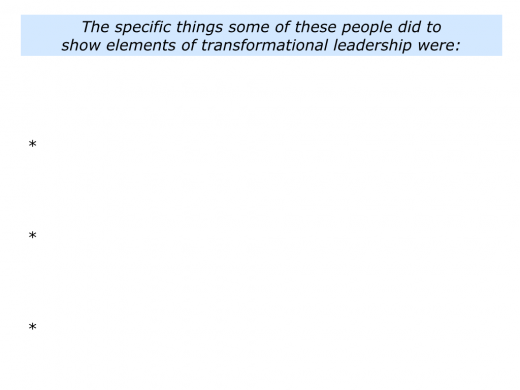 They transform an existing system – such as radically changing an organisation. They create a new system – such as building a successful prototype. They introduce a new paradigm, a new way of thinking and change people’s consciousness. 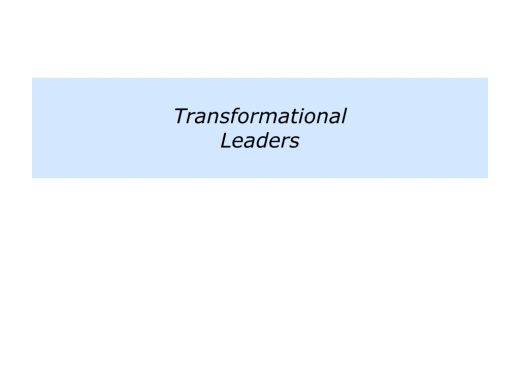 Transformational leaders may pioneer the way by changing the rules of the game. They may work as a sole contributor – such as an inventor, writer or philosopher – who shows people a new of way looking at the world. Alternatively, they may prefer to work with people on a tangible project. Building on Burns’ original definition, they encourage a group of believers who deliver brilliant results. The new approach transforms the way people feel, think or behave in the future. Certainly it is possible to get lost in semantics regarding the different styles of leadership and some styles overlap. On the other hand, it can be useful to begin identifying the characteristics of each style. This can help to choose the place where you work best as a leader. 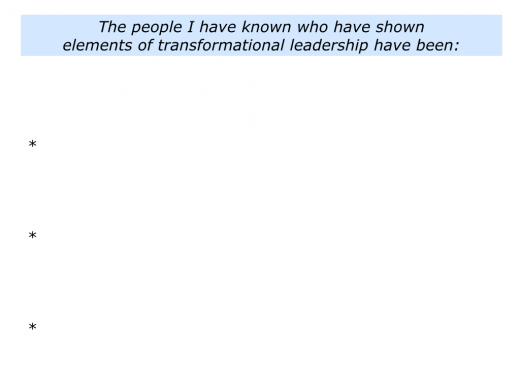 If you wish, try tackling the exercise on transformational leadership. 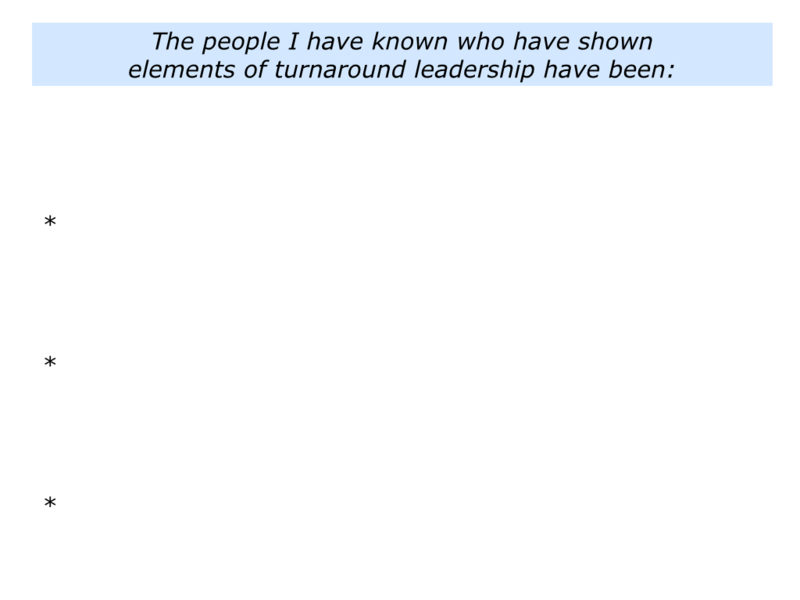 Describe some of the people you have known who you believe have demonstrated this kind of leadership. These can be people you have met or have seen from afar. They can be from education, business, organisations, politics, sport, the arts, philosophy or any field. Describe the specific things you believe some of these people did to demonstrate such leadership. Such people have some things in common with transformational leaders. They love the challenge of turning around a failing system and making it work. They have a strong belief in their own ability to make this happen. They also have the resilience required to overcome obstacles and achieve the goal. “I love to go in and fix things. Maybe it is because of my background as an engineer. “I analyse what’s wrong and get a picture of what is required. Then I implement the tough decisions required to make it work. “Interestingly, once it is functioning well, I tend to lose interest. I can take something from 3/10 to 8/10, but am not motivated to take it to 10/10. This is not the case with all such leaders, but I have heard it from many. Some also take the further step of coaching their successors who will deliver ongoing success, but that involves developing a different skill. Turnaround leaders often have the following characteristics. They are able to quickly analyse what is required to turn around the project, set clear goals and drive the key strategies to achieve success. They make clear contracts with their sponsors regarding the brief and the mandate. They do this to make sure they will get the support needed to deliver the picture of success. They move into the situation and act decisively. They focus on doing the key things that will give them – and the project – the greatest chance of success. They may take action quickly, for example, to improve the profits, products and people. They mobilise people to deliver the story, strategy and road to success. They will also implement the necessary tough decisions. They keep their sponsors proactively informed. They deliver quick results and make sure there are no surprises. They keep pursuing the key strategies and get reality checks. This feedback is crucial. They focus on: a) The things that are working and do these more; b) The things that could be better and how. They overcome obstacles and find creative solutions to challenges. They do whatever is required to deliver the agreed goals. They may hand over the reins and coach others to achieve sustainable success. Alternatively, they may simply move on. They then look for the next turnaround project. 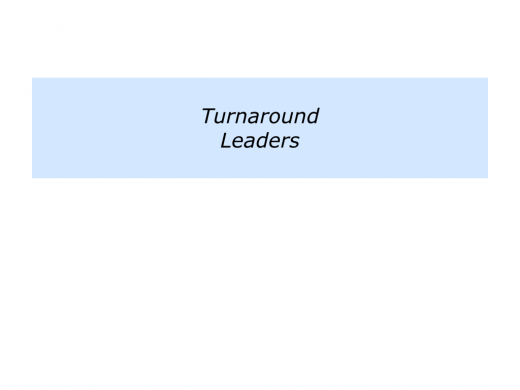 If you wish, try tackling the exercise on turnaround leadership. Such leaders often operate within a given system and make things work more effectively. They get satisfaction from making incremental improvements on the road to achieving success. “My role is being an implementer. I like to have a clear goal and guidelines within which to operate. Transactional leaders were somewhat tarred in the past. They were seen as bureaucratic, but now times, and management styles, have moved on. 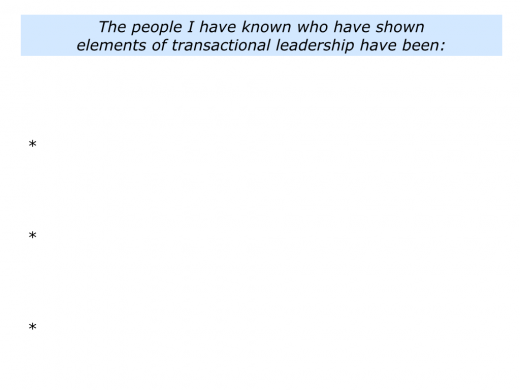 Providing such leaders engage people, they play a vital part in delivering the goods. 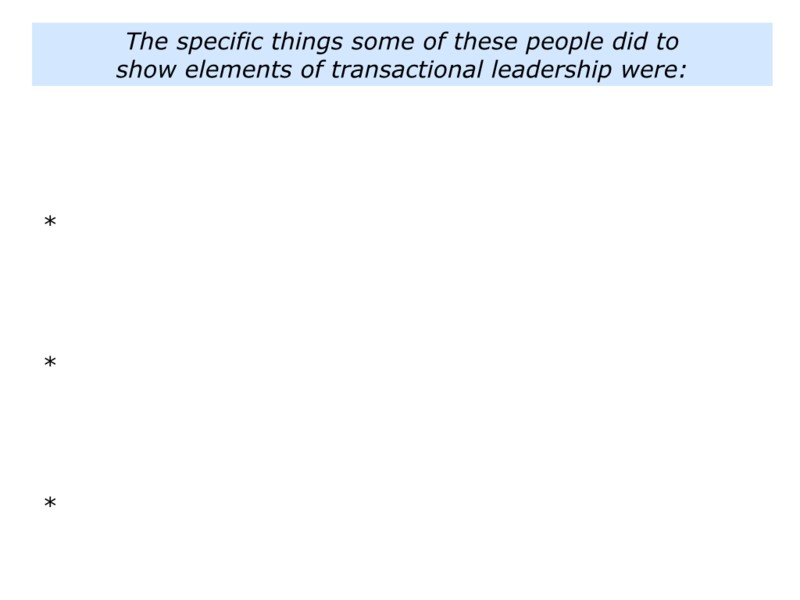 The reality is that not much gets delivered without good transactions taking place in a team, organisation or society. Good transactional leaders combine elements of both. They enable people inside a system to follow key principles and do the right things in the right way. 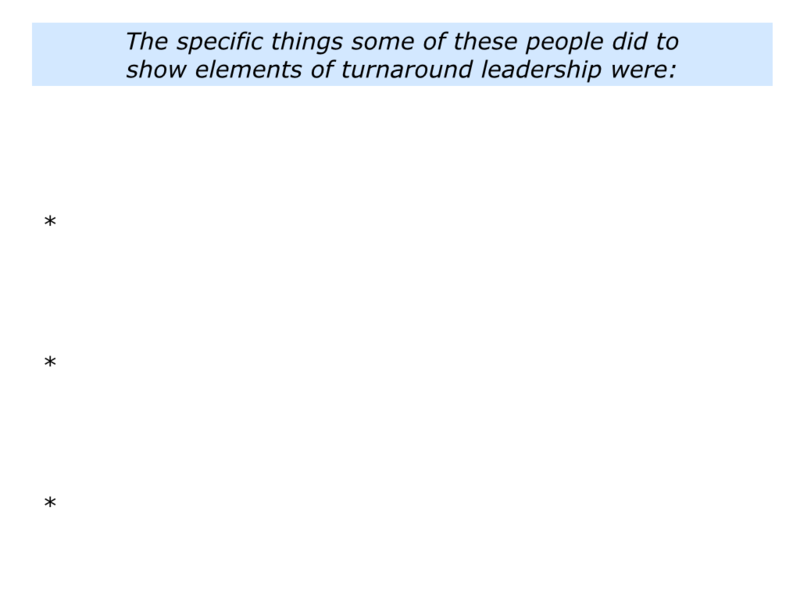 Such leaders demonstrate some of the following characteristics. They clarify the goal and the guidelines for implementing the strategy. They get satisfaction from making things work successfully. So they may double check with the sponsors to ensure they are absolutely sure regarding what must be delivered and by when. They have high professional standards and demand these from other people. – To keep an overview of the tasks. – To hire the right people, those with similar professional standards, and to delegate properly. – To keep themselves healthy, because they can burn themselves out. They translate the strategy into specific tasks that must be completed to achieve the goals. They design processes that ensure the tasks are implemented properly. 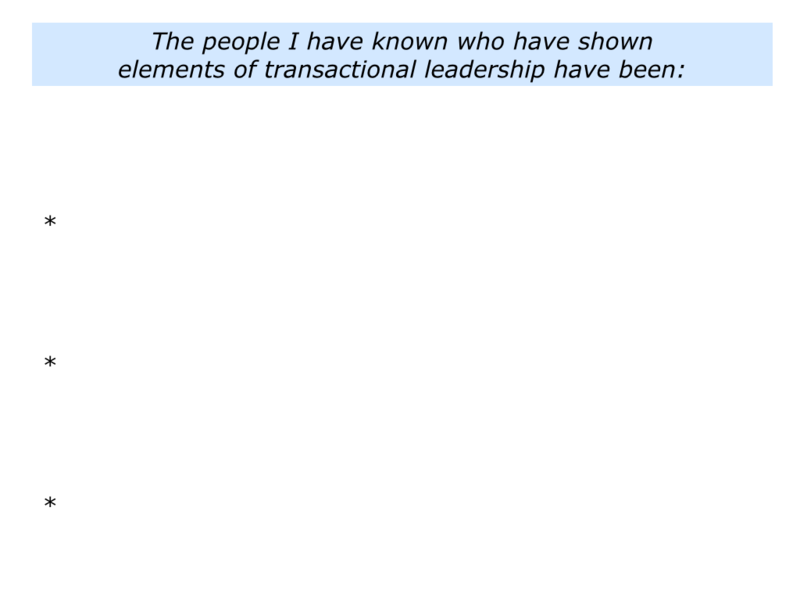 They do, if they are good leaders, give people a sense of ownership in implementing these processes. They perform superb work, solve problems and ensure people deliver the required quality. They continue improving the system’s effectiveness and efficiency. They keep their bosses informed and deliver the agreed goals. Some people, of course, combine elements of being a transformational, turnaround and transactional leader. They take the best parts of each and develop their own style of helping people to achieve success. 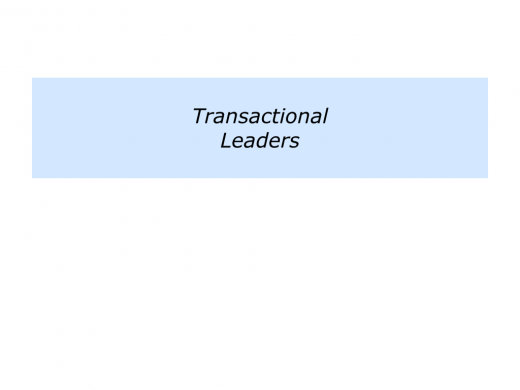 If you wish, try tackling the final exercise that invites you to focus on transactional leadership.